"Silambam" the ancient art of staff fencing believed to be originated by the body guards of the Tamil Kings which has now developed into a refined art form of self-defence and physical exercise which makes for a brilliant spectacle. The state of Tamil Nadu is considered to be the cradle of modern and scientific staff fencing, popularly known in Tamil as Silambam. The Pandya kings ruling in Tamil Nadu promoted Silambam fencing, as did their Chola and Chera counterparts. Silapathiharam Tamil literature, dating back to 2nd century A.D., refers to the sale of silamabam staves, swords, pearls and Armour to foreign traders. The ancient trading centre at Madurai city, renowned globally, was said to be thronged by Romans, Greeks, Egyptians among others who had regular sea trade with the ancient Dravidian kings. The silambam staff was one of the martial art weapons, that was in great demand with the visitors. The use of the long staff for self - defense or mock - fighting was a highly organized game in the state as early as the 1st and 2nd centuries A.D. In the Vedic age, young men were imparted training to defend themselves with staves, both as a ritual and an emergency. The staves wielded by ace fencers were given distinctive names, and treated with reverence. Some records trace the origin of this art to a divine source - Lord Muruga, and within the Tamil mythological framework, sage Agasthya is also credited with the genesis of Silambam. Silambam is believed to have traveled from Tamil Nadu to Malaysia, where it is now a popular recreational sport and also a mode of self - defense. Four different types of staves are used in this activity. One produces a sonorous, swishing sound, another involves lighted balls of cloth at one end of the staves, called 'Torch Silambam', a third is quite short in length nevertheless powerful, and finally a non - elastic staff that produces a clattering sound. Today this rather simplistic art form is a mode of self defense. used by the common folk of TamilNadu. 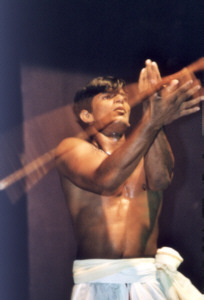 Silambam incorporates a range of techniques. By swift foot movements, large spheres of control can be established. Both hands can be used to wield the staff. Precision, force and momentum can be developed at head, shoulder, hip and leg level. The cut, chop, thrust and sweep can be used to achieve mastery. Development of a reflex defensive action, by concentrating on and anticipating the moves of the opponent and perfecting various kinds of feints in stroke play, can absolutely demoralize an adversary. The player must also be able to ward off stones hurled by a crowd, and disperse an unruly mob by a range of strokes like 'monkey hits', 'snake hits', 'hawk hits' and 'spring hits', which must be inflicted in quick succession. This activity involves some amazing footwork, staff - swinging, pivot - jumping and stroke play. From a purely defensive art, Silambam has become a combat exercise. Silambam is a three - type contest. A fight to the finish, when one of the players is dispossessed of his staff. Total number of ' touches ' one combatant makes on the other ( indicated by appropriate markings on the body ). Skill shown in protecting a pouch of money ( kept at or in between a contestant's feet ). The contestant succeeding in leaving a mark on the forehead of his opponent is adjudged as the victory n the contest. The contestants wear langots of various colours, sleeveless vests, turbans, canvas shoes, and a chest guard which is a part of the traditional attire of Palmyra tree - climbers. Wicker - work shields also form an essential part of the gear. The contest begins with salutations to God, the competitor, the audience and the guru. The result is determined on the basis of the number of touches made by one contestant on another. To distinguish these touches, the ends of the staves are coated with a sticky powder that leaves behind a mark . The mark generally counts as one point, but in certain areas, a touch above the waist counts as two points, while those made below get only one point. In certain areas, the winner is one who makes a mark on his opponent's back, while in others, the contestant who makes the first three touches on the other's body wins. The contest comes to a close, after a period of time fixed well in advance of the contest, or when one of the contestants is dispossessed of his staff. Silambam is fought on an even and hard surface, but never on a sandy or slippery area. The arena of this activity is usually circular, the radius not less than 20 ft and not more than 25 ft, when only two contestants are involved. The duration ranges from 6 to 10 minutes, which is divided into four equal quarters. An interval of one minute is allowed at the end of the first and third quarters, while at the end of the second quarter an interval of 3 minutes is allowed. This is a very popular form of martial art, which has survived the tests of time. The name is derived from the wishing and whooshing noise created by the movement of the pole used in this combat. In Malayalam, it is known as Neduvari; in Kannada, Thanda Varisai, in Telugu Karadi Aattam. Generally youth and middle-aged men involve in this. They fight with long bamboo poles. During the fight one has to protect oneself from being hit by the opponent's pole. It is used for self protection and exercise. Eye, leg and hand co-ordination is very necessary. Movements of beating, swinging the pole and circling the pole are involved. Quick steps, jumping and running are also essential. It can be practiced one against one or one against many. Success in indicated when one manages to knock the pole from the opponent's hand. Expert care is given to the practice of preventing the opponent's pole from touching one's body and also to the touching of other's body with one's own pole. In Tamilnadu, Silambaattam is popular in the southerm districts, particularly in Tirunelveli district. This district has given birth to many famous silambaatta experts like Kattabomman, Umaithurai, Marudupandi etc. the person who teaches this art is known as Silambam Vaathiyar or Aasan. This art was practiced as a game during festival times, accompanied by song and music. In Jalli Kambu method, the opponents fight with each other armed with tow short sticks of 2 ½ feet length. This is similar to the western wrestling. It is placed among the 64 arts listed in ancient literature. The art reached its zenith in Tamilnadu during the Pallava period. During mid-Chola period mallas ( artistes ) went to Sri Lanka to participate in tournaments. The art was taught in ancient days by persons belonging to the Malliga Chetty community. Here, the opponents wrestle with each other, attempting to push the other down. Various rules of the game appluy to the procedure. In a tournament, wrestlers travel far and wide, challenging local wrestlers, and if they win, the name and fame of their own town or area is multiplied hundredfold. This martial art was famous all over India. It has been mentioned in the great epics of the country, like Ramayana and Mahabharatha. In Tamilnadu, this art reached its zenith during the Chola period. This art was well-known to highlight the physical prowess and courage of Tamil kings and warriors. In this, the opponents fight using swords, protecting themselves from the swing of the other's sword, at the same time trying to wound the other with their own sword. Winning is determined when one person in sounded or his sword is struck to the ground by other. Sometimes, shields were also used for self-protection. This art involves gymnastic skill and perseverance. At the top of a tall pole, a pot filled with colored water is tied. The bark of the pole is stripped off and the trunk is rubbed well with oil to make it as slippery as possible. The youths try to clamber up the pole, while the others stand round them and pour water on them and shout to distract them. The successful youth is the first one to reach the pot and break it. The successful one gets gifts, money and so on. This is still considered as one of the activities of courage in Tamilnadu. This is another form of boxing, slightly varied from wrestling. In this, the fighters rain blows on each other, thus attempting to floor them. This also, like wrestling, was taught in kalaris. Such skilled warriors can defend themselves with bare hands against any weapon. The picture shows a young man overcoming an opponent armed with a knife. This art of overcoming a ferocious bull is popular even today in the villages. A bull is specifically reared for this purpose, its horns sharply honed and dreadfully dangerous. When it is let out of the enclosure, many youth or a single youth run with it trying to overcome it by holding down its horns or climbing on its back. This is a very dangerous activity as one hit from the sharp, pointed horns means sure death. Normally, money or gold is tied to the horns and the successful youth removes it. At times, it is used as a method of selecting a bridegroom for a well-sought-after and beautiful bride. In Tamilnadu, nowadays , this activity is involved in on the day after Pongal, which is known as maattupongal or Bullocks Pongal. This is organized very efficiently at Alanganallur near Madurai. Many tourists form all over the county and also from other countries visit this place to enjoy the fight.